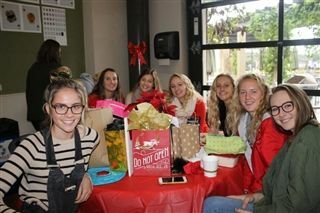 Nearly 700 students, faculty, staff and alumni celebrated the beginning of holiday break on December 16 at the annual Gingerbread Breakfast. The army of organized and gracious parent volunteers ensured the rain didn't put a damper on the festivities. Thanks go to the Parents Association and the many volunteers who contributed food and baked items, as well as those who set up, served and tidied up after the breakfast. Their efforts made the 2016 Gingerbread Breakfast a continued favorite in the hearts and stomachs of all!